Josh Brookes clinched his first TT Mountain Course win with victory in today’s thrilling Bennetts Senior Classic TT Race, the opening race of the 2017 Classic TT Races presented by Bennetts. 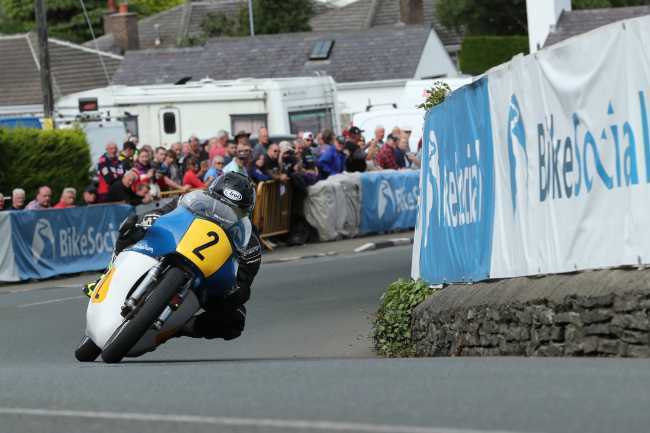 After a short delay to clear an oil spill on Bray Hill, the Isle of Man Classic TT Races roared into life at 11.45am. Last year’s race winner, 23 time TT Race winner John McGuinness, was the official race starter as he continues his recovery from injuries sustained in his North-West 200 accident. Ian Lougher, the 2014 race winner, had the honour of being first away on the John Chapman Racing MV Agusta but the Welsh rider was reported as a retirement at Greeba Bridge on the opening lap. 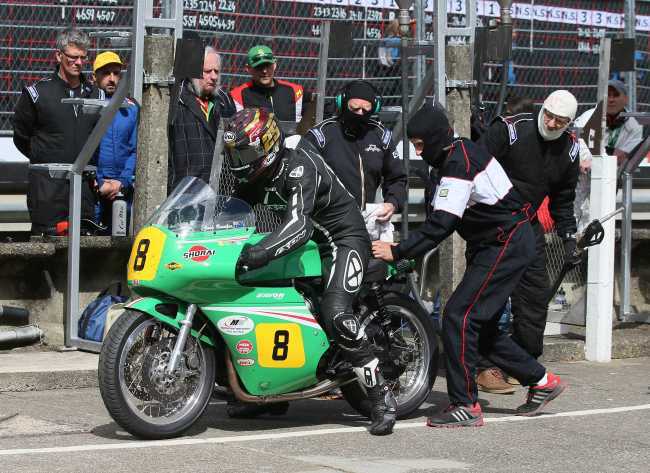 Dean Harrison on the Black Eagle Racing MV was also out of the race on the opening lap at Ballagarey while Michael Rutter was unhurt after sliding out at Ballacraine on his Ripley Land Racing Matchless bike. 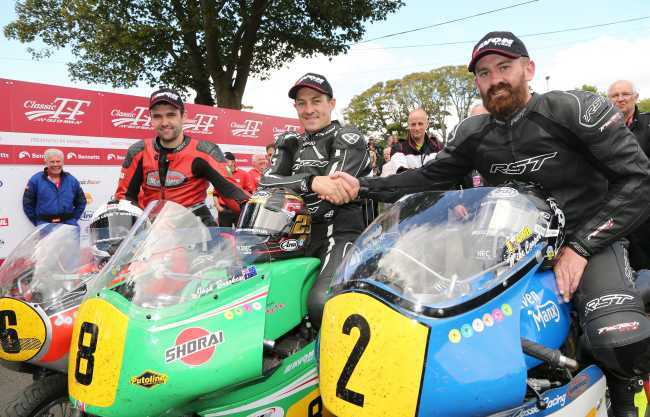 Brookes was first to Glen Helen, establishing a lead of over seven seconds from William Dunlop on the Davies Motorsport Honda with Maria Costello, looking to emulate her podium place in last year’s race, in third on the Team Beugger Paton less than a second behind Dunlop. Jamie Coward on the Ted Woof Norton was fourth half a second further back with Michael Dunlop riding the Black Eagle Racing MV Agusta fifth.Coward moved into second place at Ballaugh but was already twelve seconds behind Brookes and the Australian extended his lead to over the second placed man to twenty seconds by Ramsey. Alan Oversby, who was in fifth place, was black flagged at Sulby Bridge with smoke coming out of his Davies Motorsport Honda machine but the Morecambe man was allowed to continue, and given a time credit for the stop, although the bike eventually gave up the ghost at Ballaugh Bridge on his second lap. Jamie Coward was first through the Grandstand clocking 108.340mph but Josh Brookes was the leader at the end of the opening lap with his lap of 111.295 (20:20.432) – his fastest of the week. Maria Costello maintained her third place (108.204) a second behind Coward with William Dunlop (107.743) and Bill Swallow (105.625) rounding out the top five. However Swallow, who came into the pits at the end of his first lap, was given a thirty second penalty for speeding in the pits which dropped him down the order while Michael Dunlop retired in the pits at the end of his opening lap when running in 11th place. Josh Brookes posted 110.839 on his second lap, and elected to run straight through which gave him a lead of almost forty seconds over second placed Coward - who was timed at 110.054 - which would be needed with Coward able to complete four straight laps on the single cylinder Norton. Costello, however did choose to come in for a ‘splash and dash’ on the second lap and her lead of less than a second over Dunlop became a forty eight second deficit by Glen Helen on her third lap with Dunlop still to pit. Michael Russell riding for Izzard Racing Norton was the leading privateer and completed the top five. The true race leader board only became clearer at the end of the third lap with Josh Brookes coming in for a fifty-three second pit stop after a lap of 110.823 and Jamie Coward running straight through after a third lap of 110.057, the fastest ever single cylinder lap of the Mountain Course. Brookes lead was duly revealed to be down to 2.5 seconds ahead of Coward at Glen Helen on his fourth lap. William Dunlop also came in at the end of his third lap (108.606) and with a 39 second pit stop, he remained in third place at Glen Helen on the last lap, 8 seconds ahead of Costello but well over a minute behind the leading pair. Coward held the runner up position with an overall race time of 1:22.45.472/ 109.412 while Dunlop clinched the final podium place with a last lap of 104.449 and an overall race time of 1:24.18.778/ 107.400. Costello (1:24.26.278/ 107.241) finished fourth with Dominic Herbertson fifth and Bill Swallow sixth. Michael Russell, who finished in seventh place, was the leading privateer. Josh Brookes gets a push to get going out of the pits in the Bennetts Senior Classic TT Race on the Team Winfield Paton. 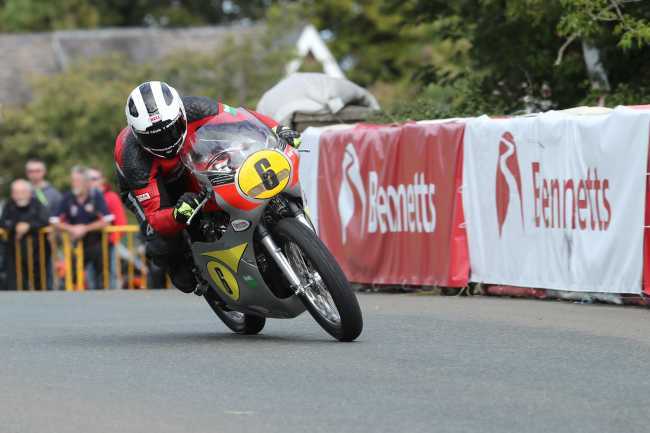 William Dunlop (500 Honda/Davies Motorsport) at Sulby Bridge during the Bennetts Senior Classic TT race.